Last episode of the Cinderella story that started off the first issues of Jinty, namely “Make-Believe Mandy“. Mario Capaldi is powering ahead with the antics of Katie Jinks; he clearly adopted a slightly different style for this humour strip, with more exaggerated features, grimaces, motion lines and so on than in his ‘straighter’ work. Phil Townsend’s art is beautiful, as ever, in the sad story “Always Together…”; beautiful, but rather old-fashioned in feel. This was probably his first story for Jinty and certainly generally I would think of his art as classic rather than positively old-fashioned. Yvonne Laroon comes from a long line of circus performers and her family takes it for granted she will follow in their footsteps. But ever since Yvonne saw Swan Lake on television, she has had other ideas – to become a ballerina. She certainly has talent for it, thanks to her acrobatic circus skills, but no formal ballet training and does not even know what a plié is. Even worse, her parents do not approve, saying she is born for the circus and that is that. Yvonne comes across Alexia Company Ballet School and climbs up onto the roof to take a look at a lesson. She gets more than she bargained for and ends up crashing through the roof. She is mistaken for a new girl they were expecting. After a demonstration of what dancing she can do, she is accepted into the school. But as her parents still won’t hear of her becoming a ballerina, to the point of Dad threatening to belt her, she runs away from the circus to the school. She decides to keep her circus origins secret, fearing expulsion because of it. Having had no ballet training, Yvonne has to pick it up fast, by watching how others move and swotting up ballet books. And of course there has to be a jealous rival out to make trouble. In this case it is Lisa Telemann, a star pupil from a rival company, Pavel. Lisa becomes suspicious of Yvonne’s origins and eventually finds out the truth. Lisa gets peeved when Yvonne becomes a cygnet in The Dance of the Little Swans. She tries a blackmail note and then a phony telegram to recall Yvonne to the circus. At the circus, Yvonne discovers the trick. But her father disowns her when she insists on continuing with ballet. Worse, on the way back Yvonne has an accident and loses her memory. This causes her to fall into the power of the unscrupulous Ma Crompton, who takes advantage of her amnesia and dance talent to exploit her. Yvonne eventually escapes Ma Crompton and comes across a Swan Lake poster that stirs some memory. She heads to the theatre, not realising Lisa has spotted her, and Lisa arranges for the doorman to block Yvonne. Yvonne ends up in a home, where the matron takes her for a bad sort and threatens her with the reformatory. Yvonne runs off, where she bumps into the circus and saves the horses from an accident. During the process Yvonne bumps her head, which restores her memory. She is reconciled with her parents, who stop interfering with her dream after they hear what she has been through. They take her back to the ballet school. Lisa’s trick with the telegram is discovered, and she is expelled. Yvonne can now study ballet without interference. Ballet stories are bread-and-butter in girls’ comics, so Jinty’s first line-up would hardly have been complete without one. It was drawn by Miguel Quesada, a regular on the Tammy team during her first five years, but this was his only outing in Jinty. Quesada drew some ballet stories for Tammy as well, but it must be said that he could have done with more research on drawing ballet. The poses look angular and positions often not drawn correctly. And the title itself sounds a bit uninspired and perhaps could have done with more imagination. Storywise, there are certainly plenty of well-tried elements in girls’ comics to keep the drama high and ensure readers stayed hooked on this one: circus theme, fugitive theme, jealous rivals, amnesia, exploitation, determination and courage, difficult parents, a nasty matron, reformatory, and even some laughs as Yvonne gives demonstrations of her circus tricks. Ballet theme combined with circus theme would certainly have been a powerful combination. The circus is always popular in girls’ comics (although the theme was oddly sporadic in Jinty). Contracting amnesia and falling into the clutches of a crook because of it is an oldie but a goodie in girls’ comics, and would certainly have helped to make this story popular as well. There is also plenty of action and the story moves at a cracking pace. In summary, “A Dream for Yvonne” had plenty in it to make it a strong, thrilling, fast-paced story in the first line-up. The episode where the father disowns Yvonne is a shock that must have taken readers by surprise. Parents who disapprove of their daughter’s dreams are common enough in girls’ comics, but seldom do they go that far. The father’s move is even more shocking as the parents do seem loving and caring – just lacking a little understanding. It must have been a relief to readers when the parents finally change their minds and start helping Yvonne. Incidentally, the episode where Yvonne is threatened with the reformatory has echoes of a Quesada story in Tammy, “The Stranger in My Shoes”. Could it be the same writer? I am skipping ahead to 1978 because of some exciting news yesterday – the identification of an artist who is a favourite of mine and co-writer Mistyfan’s, but who had been languishing in the “unknown artist” group until now. The beautiful cover art above is by Terry Aspin, a Welsh artist based in Wrexham. His granddaughter, Josie Rayworth, indicated that Terry drew for Jinty amongst other titles and the rest of the detective work proceeded quickly. A specific blog post for Terry will follow in due course, covering his work on Jinty stories such as “Alice In A Strange Land”, “Toni on Trial”, “The Girl Who Never Was”, and “Almost Human”. One of the aspects of the cover montage above that I particularly like is that it uses images from much of the story, rather than simply some images from inside that specific comic issue. You get a good impression of the whole story therefore. Clearly either the whole story must have been already in the hands of the editors so that they could do the montage, or Terry Aspin did the cover himself having drawn much of the story. “This is the story of a friendship between Jenny and Laura and how it broke up. Jenny tells the story while the editor questions her – and you, readers, must decide in the end who was to blame”. It all comes to a head when Laura’s birthday comes up. Jenny is furious when Carol’s present (a real gold bracelet) outdoes hers and believes Carol did it on purpose. Not to be outdone, she hires a conjurer for Laura’s party. Carol realises this and confronts Jenny, who replies, “Laura’s my friend, so she does not need presents from you!” But it backfires when Jenny finds she did not understand that the £2 she paid the conjurer was meant to be a deposit, not the full fee, and another £3 is required. Carol graciously offers to pay the money. But Jenny is far from grateful – she accuses Carol of making her look a fool and hits her. It is then that Laura breaks up with Jenny, saying it is because she has changed. A very tearful Jenny tells us that she just wanted her friend back and never wanted any other friend but Laura, because Laura was the best friend she had ever had. She asks if it was her fault and if so, where did she go wrong? “I can imagine how Jenny felt. For so long there had been just her and Laura; they had grown up together, been together since they were tots. Then along comes Carol – and Jenny resented her. Which, perhaps, was quite natural. But where Jenny went wrong was to allow Carol to spoil her own relationship with Laura. Laura was right, Jenny did change. She played mean tricks and she lied and cheated … and all because she wouldn’t share Laura with another girl. Serials about friendships turning sour because of jealousy, or protagonists telling their own stories is nothing new in girls’ comics. But what is new, perhaps even unique, is the agony aunt take on it. Readers are invited to not only read and enjoy the story, but also participate in it, with assurances of their being the jury at the end of the story. So it must have been a let-down at the end when in the end there is nothing anywhere – not even an invite to the letters page – for readers to express their judgements on who is to blame. Instead, the editor presents her own opinion. But what still catches your attention is the constant breaking of the Fourth Wall as the editor keeps questioning Jenny (in black speech balloons) and Jenny giving her replies. This is certainly a different take on the modes of storytelling in a girls’ serial. But this was the only time it ever appeared in Jinty. To the best of my knowledge it never appeared elsewhere. Perhaps it was an experiment that did not prove as successful as hoped? Maybe it was too moralising and preachy for readers’ tastes? Or was it just meant to be a one-page filler? Even more to the point, why did this format appear at all? Perhaps the editor was experimenting. 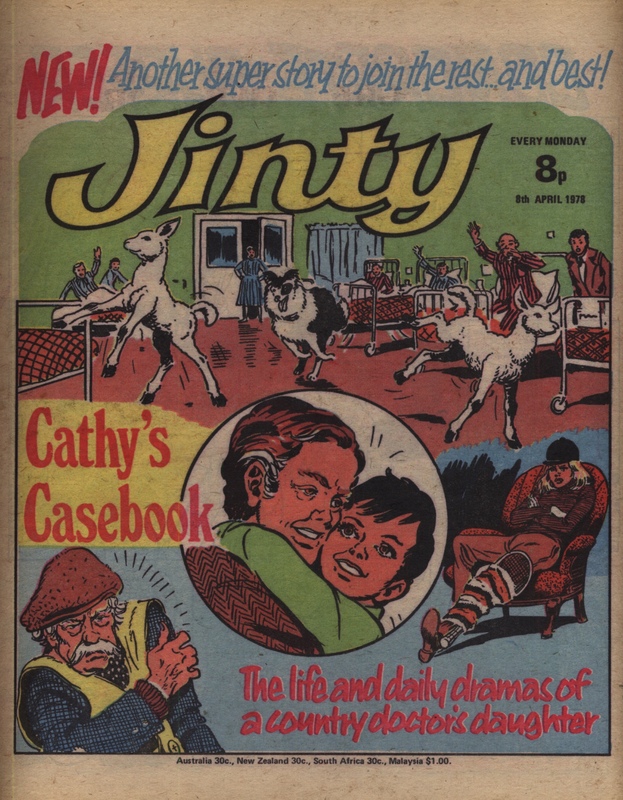 After all, Jinty was still new, and must have been open to innovative and fresh ideas. Or was it reprinted from elsewhere as a stop gap while Jinty was setting up other things in her line-up? Ah, the things we may never know without interviews. Incidentally, Jinty‘s foray into the world of the agony aunt did not end with this story. Later she would run a problem page, and also a series called “Is This Your Story?“, where she would portray stories about problems and lessons that readers might relate to. In one story, a twelve-year-old thinks her parents are treating her like a baby, but eventually realises she was trying to grow up too fast. In another, a girl has developed a bad habit of telling lies. But inevitably she gets caught out in a lie and now fears expulsion. The cover looks in places a little as if another artist could have done the finishing, but that could perhaps simply be the print quality; certainly the black and white story pages inside are clearly Mario Capaldi doing the Jinx From St Jonah’s; the transition to another artist still lies a little ahead. There is some sort of special “pull out” in the middle pages – part 5 of 6 – “all about you!” – with tips on looking after your skin and a section of horoscope (Virgo and Libra). More interesting to me now is the first episode of “Left-Out Linda” drawn by Jim Baikie – the first time I know of this long-term and popular artist appearing in Jinty. Another new story starting this issue is “Wenna the Witch”, art by Carlos Freixas; again the first instance I know of his art appearing in Jinty. Jenny – Good or Bad Friend? This marks the first of the style of cover that I have remarked on previously: a page of “The Jinx From St Jonah’s”, promoted to the front page as an enticement to the reader. The layout is more boxy than is the case later on, with more panels and less of a ‘splash page’ feel (excuse the pun, given what is depicted here). Mario Capaldi’s art is nice, but not quite as elegant as it later becomes: Katie Jinx’s legs and arms in the first panel, in particular, are rather spindly. Pony Parade 2: Don’t Call Me Ragbag! I don’t know what happened to the bracelet from the first issue, but we used this hairbrush as a doll’s hairbrush for a long time. Pony Parade 1: Sandy, Come Home! 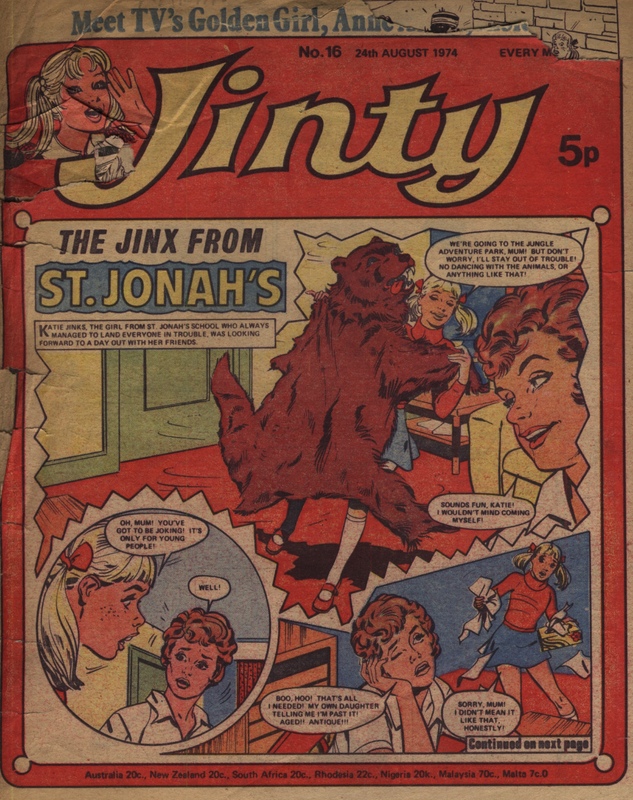 This first issue has the wide mix of stories that characterises girls’ comics generally at this period: humour strips and gag strips (“Dora Dogsbody”, “The Jinx From St Jonah’s”, “Do-It-Yourself Dot”, “The Snobs and the Scruffs”, and “Desert Island Daisy“), a couple of spooky stories (“The Haunting of Form 2B”, “Gail’s Indian Necklace“), a slave story (“Merry at Misery House“), a Cinderella story (“Make Believe Mandy“), a friendship story (“Angela’s Angels“), and a deception story (“Gwen’s Stolen Glory“). In fact the weighting given to humour and gag strips in this first episode is a bit overwhelming, and this is quite soon slimmed down so that only a couple of these items run each issue. 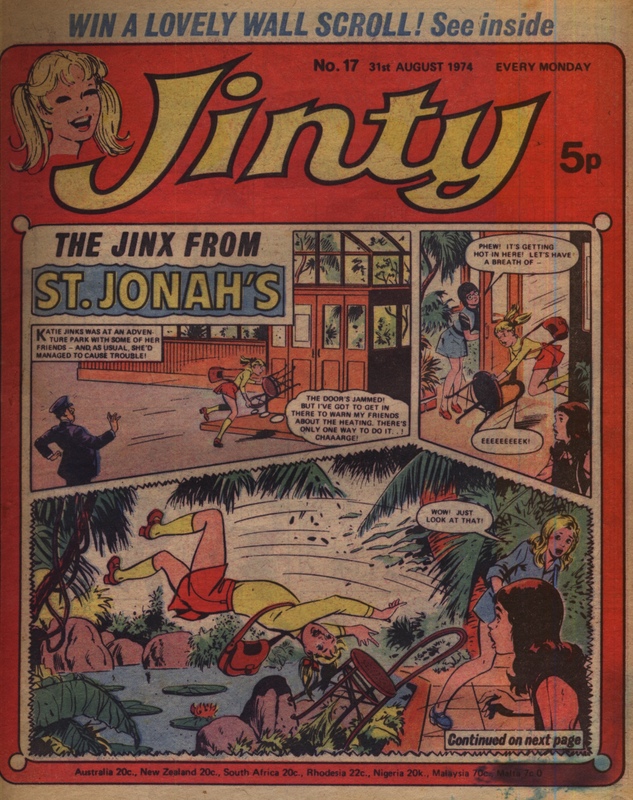 In addition to the competition, there was also a single page text story (“Sandy, Come Home!” – labelled Pony Parade 1 – and a “Jinty’s Fun and Games” page with single-panel gags and, coin tricks, and so on. Further on there was a page with some “Well I Never” surprising facts and a recipe for making soup. The last page was dedicated to a “Jinty made it herself… so can you!” item. In future issues the text story was gradually phased out (returning sporadically); the other items were reasonably regular types of feature. Of course in this first issue there could be no letters page yet. 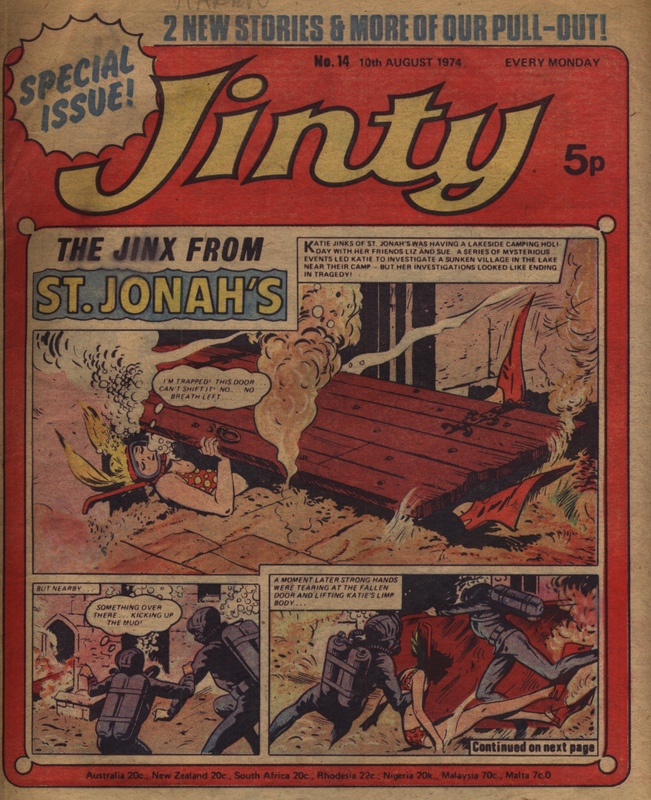 Altogether, it does feel like a very packed-out issue, if not yet showing the unique slant that made Jinty special to me and lots of other readers. Publication: 5 November 1977 – 11 February 1978; reprinted 3 January 1981 – 11 April 1981 as a result of Pam’s Poll. Cassy Shaw was born with one leg shorter than the other and a consequent bad limp, but she doesn’t feel sorry for herself; what’s more, she is quite happy to play on the sympathies of those who do. Her parents have different ideas: they arrange for her to have an operation that will correct her disability. In the operation, something very unusual happens: Cassy is whirled away through time into the future, a cruel future in which girls who are less than utterly perfect are treated as second-class citizens. She is greeted (with something very different from the sympathy she is used to) by Alpha girl Perfecta, who takes her to the nearest communal home or hive, run by a ‘hive mother’, who takes in children from the age of four and turns them into emotionless, physically perfect “superior girls”. Things initially look sticky in the first round of the Golden Girl trials, but Cassy wins her swimming heat, causing Perfecta to sweat as she realises “She’s better than me! She’s better than me! Those wretched Gamma girls could get through to the final… Could even win the Golden Girl award. I feel sick!” Not so fast – an announcement comes over the tannoy saying that Cassy has been disqualified – there are no records for her, and so the authorities think she must be competing under an assumed name. A reprieve happens when the computer fails to match her up with anyone else – as indeed how could it, as Cassy’s voiceprint and fingerprints never got recorded in this future time. However, this has brought suspicion on the hive generally and further investigations are promised. Miranda’s mother appears in time to watch her gymnastics performance, which starts off lacklustre but is spurred on by her mother’s presence. This gives the Golden Girls another win, but the mother is furious – with Cassy. “Thanks to you, the Hive Inspector is coming down to investigate. He’ll ask questions about everyone. He’s certain to find out I’ve been meeting my daughter in secret. And then they’ll take her away from me, for ever!” (Yes, that was her secret – or at least, part of it…) Because of this, Miranda feels she can’t be friends with Cassy any longer; and Perfecta, desperate to train as hard as possible, breaks off with her best friend too, setting things up for a head-to-head between the perfect girl and the 20th century “reject’. It’s a head-to-head that seems doomed to failure for Cassy, not because she is slower than Perfecta, but because Perfecta is about to spill the beans to the visiting Hive Inspector about having seen Miranda’s mother where she wasn’t supposed to be. “When I tell him, he’ll have Miranda and her mother put into a special prison… and serve them right, too!” Cassy can prevent this – but only by promising to lose to Perfecta in the Golden Girl finals. Miranda’s mother comes, sobbing and grateful, to thank Cassy for this sacrifice; the heavy make-up comes off with her tears and reveals … Miss Norm, the Hive Mother! That’s how she has managed to appear and disappear so unexpectedly at times. Cassy is out of the running because of her promise, but she hasn’t told any of the other Gamma girls, who do well in the final heats. Perfecta draws inexorably ahead as Cassy lets her win, but suddenly Perfecta screams in pain – she has done something to her spine by pushing herself faster and further! She is out of the race, and Cassy speeds up to try to make up for lost time. Even the crowd are on her side, now, despite the Hive Inspector urging them to “Remember your conditioning… “Feelings – bad! Bad! Self-control… Good! Good!” In a final surge, Cassy pips the other racers and ensures that the Gamma girls win the award – to the cheers of the crowd, who push the protesting Hive Inspector out of the way and into the pool. I keep on comparing Jinty stories with other media items: Children of Edenford with The Stepford Wives, Almost Human with Superman. Not without reason – this revisioning of stories from elsewhere was an acknowledged policy of girls’ comics, as Pat Mills explained to me back in 2005. Well, this story is nothing so much as Brave New World, Aldous Huxley’s sf classic, done schoolgirl-style. The future is cold, regimented, divested of family feeling, inhuman; the people in it are divided into superior types and inferior “rejects” (even the Alpha and Gamma terminology is taken from Brave New World). However, the main point of the story is picked up in the word “elitism” that Mills mentions in that interview. Like “Children of Edenford”, the newcomer is faced with a group that creates and values a certain set of élite qualities, though the specific qualities are different in this story, focusing as they do more on physical perfection. Protagonist Cassy is fired up by the injustice of this; her response to this society is not just selfishly wanting the sympathetic response she was used to in her previous world, but to tear down the whole evil structure – a true class warrior response. (In fact, although her normal world is much more comfortable for her, it also did her few favours by not making her challenge herself in the way that she is clearly capable of, not that she would necessarily have seen it that way.) Cassy’s journey from selfish manipulator to crusader is quick: in the first episode she is shown cannily and coldly getting her own way, but as early as the second episode she is already thinking of the wider picture (she comforts one of the crying four-year-old new Hive entrants by giving her a doll). Again as with “Edenford” and other stories of this kind, some of the interest is in the sheer outrageousness of how far the writer is prepared to ladle it on. The future girls are called ‘Perfecta’ and ‘Divina’; they take showers in icy-cold water; the girls wear big As or Gs on their clothes to denote their status. This verve moves the story on quickly, still including touches of realism, such as the bitchy relations between the lower-class Gamma girls, who have no-one but each other to pick at. If you are picky, there are indeed plot holes to poke at. How did we get from our current soft-hearted society to the future hard-nosed one? Does the setup apply across the world, and if so what will happen given the collapse of the hive society at the end of the story? (And if it wasn’t world-wide then what happened in terms of collaboration between different types of society?) And most of all, how can it be that positive human emotions such as the love shown between Miranda and her mother is at all sustainable, even in hiding, in this repressive set-up? These are however side-issues that don’t occur as you avidly read through this exciting story. Unlike almost all other Jinty stories, in this case we know both the artist and the writer. Pat Mills is well-known for writing science fiction and anti-establishment stories, so it comes as little surprise to assign his name to this story. Artist Guy Peeters has a distinctive style that makes it easy to link his uncredited art to the stories he did later on when credits were published. I would say that this is one of Peeters’ best works, with varied layouts, expressive features on the characters, and a solid depiction of the uncaring future society. It is little surprise to me that this story was shortlisted in Pam’s Poll for readers to vote on a reprint of, nor that it should have emerged a winner.